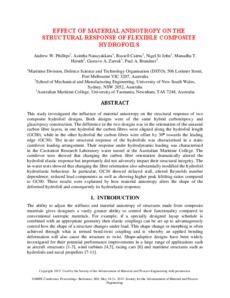 This study investigated the influence of material anisotropy on the structural response of two composite hydrofoil designs. Both designs were of the same hybrid carbon/epoxy and glass/epoxy construction. The difference in the two designs was in the orientation of the uniaxial carbon fibre layers, in one hydrofoil the carbon fibres were aligned along the hydrofoil length (GC00), while in the other hydrofoil the carbon fibres were offset by 30 towards the leading edge (GC30). The in-air structural response of the hydrofoils was characterised in a static cantilever loading arrangement. Their response under hydrodynamic loading was characterised in the Cavitation Research Laboratory water tunnel at the Australian Maritime College. The cantilever tests showed that changing the carbon fibre orientation dramatically altered the hydrofoil elastic response but importantly did not adversely impact their structural integrity. The in-water tests showed that changing the fibre orientation also substantially modified the hydrofoil hydroelastic behaviour. In particular, GC30 showed delayed stall, altered Reynolds number dependence, reduced load components as well as showing higher peak lift/drag ratios compared to GC00. These results were explained by how material anisotropy alters the shape of the deformed hydrofoil and consequently its hydroelastic response.